Mangaluru, Sep 8,2017: The DK and Udupi district education department has decided to go all out to monitor, guide and preempt the ’Blue Whale’ syndrome out to cause distress to children. It has formed a strategy to bring max awareness among students, teachers, parents/guardians in the district specially urban areas, in pursuance of the State education department instructions. The Department of Public Instruction (DPI) has directed its officials to take measures to prevent children falling prey to Blue Whale game. Sowjanya, commissioner, DPI, has issued a circular to deputy directors, block education officers, head masters and teachers. The DPI circular directs teachers, parents, School Development and Monitoring Committee (SDMC) and voluntary organisations to conduct regular meetings to create awareness among children and parents about ill effects of the game. The Commissioner has instructed them to publish pamphlets and circulate among public, take out processions, issue press releases to papers and organise awareness activities every day in schools so that children stay off from certain websites and deadly games. The DPI has advised teachers and parents to approach police and issue instructions to internet centre owners directing them not to permit children play the game through the police. The DPI has advised parents and teachers to check out following five developments among children. * Whether there are any unusual symbols and scars especially on shoulders and lips. * Whether children watch horror movies continuously. * Whether children post depressing messages and selfies on social media. The story of a 17 year old survivor : A harmless looking link on Facebook got a 17-year-old girl from Jodhpur in Rajasthan entangled in Blue Whale Challenge trap. 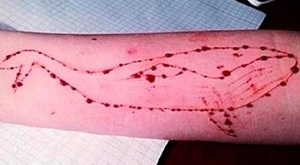 The girl, who was lucky to survive two suicide attempts, told media “I was online on my mobile and Facebook and a few other websites were logged on and suddenly I received an invitation to download Blue Whale game and I did.” The survivor claimed that she had heard about it but was handling it herself for the first time. “I downloaded and kept surfing and completing the tasks,” she added. In the last phase of the game, the administrator asked her to commit suicide in order to save her mothers life. He gave four options-- 1) Jumping into a water body; 2) hanging on a ceiling fan; 3) consuming poison, and 4) getting laid over a railway track. “I took the first option and preferred to jump into the lake,” she added. The girl, the daughter of a BSF jawan, was treated by Dr K R Daukiya and he had requested the media not to ask probing and irritating questions as she was coming out of depression. The doctor said the girl was normal now and was rescued from the scary game. Government has to take action, many especially the youth have been targeted as they loose life.